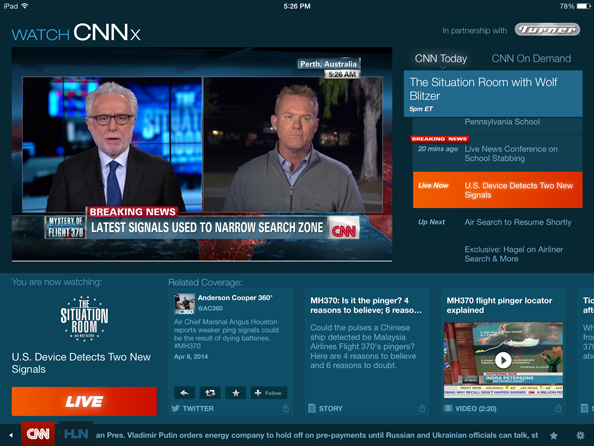 CNN has announced CNNx, a new iPad service that allows customizable TV news experiences. Through Watch CNNx users can access 24 hours of program rundowns and select on demand the segments they want to view, according to a statement issued by the network. Access 24 hours of CNN television rundowns to see segments they’ve missed or what’s coming up next. Control their own news experience by previewing or scrolling back through the segments they want to watch. Go deep on any topic or issue covered with related digital content automatically curated in real time – articles, images, social commentary, and more. Watch CNN TV live or on demand. CNNx is available via the CNN App for iPad to customers of select TV providers and will be offered to all TV subscribers later this year. Additionally, Watch CNNx will debut on set-top boxes and CNN.com by the end of 2014.